The Pittsburgh Steelers are moving up in the AFC North after beating the Baltimore Ravens 19-16 Oct. 20. After starting 0-4, the Steelers have won two straight and are working towards leaving the cellar of the AFC North. Rookie running back Le'Veon Bell led the Steelers in rushing with 93 yards on 19 carries. Bell's powerful running opened up the pass for Ben Roethlisberger, who hit tight end Heath Miller with a shovel pass from three yards out, resulting in the Steelers' only touchdown in the game. However, aside from the shovel pass from Big Ben to Miller, the Steelers' struggles in the red zone continue. Kicker Shaun Suisham's four field goals were enough for the Steelers on Sunday for the second week in a row. But in order to keep winning games, the field goals must be replaced with touchdowns. The spread offense the Steelers are running is not effective in the red zone. When a team drops back to pass, there isn't enough room for the defense to get opened. Hard-nosed, multiple tight end sets that are used by the San Francisco 49ers inside of the 10 yard line are most efficient deep in enemy territory. The Steelers are still capable of using those types of sets, but they're not a power running team like they used to be. Bell is showing potential, but fellow running backs have been lackluster. Jonathan Dwyer has underachieved, Felix Jones has not been much of a factor, and Isaac Redman, who was Rashard Mendenhall's competent replacement late last season, was cut this past week. The 2-4 Steelers will be visiting the Oakland Raiders at 4:05 p.m. on Oct. 27. Unlike their division rival, the Cleveland Browns are heading south in the AFC North. After leading the Browns to three straight victories, journeyman Brian Hoyer tore his ACL, re-opening the door for quarterback Brandon Weeden. Weeden is 0-4 as a starter after losing to the Green Bay Packers 31-13 on Oct. 20. Weeden threw for 149 yards and a touchdown to tight end Jordan Cameron, but his completion percentage was a dismal 40 percent and he threw an interception. On the ground, Weeden was able to pick up 20 yards on two carries, but running back Willis McGahee was the leader on the ground, gaining 39 yards on 11 carries. The Browns' defense disappeared in Green Bay. The pass rush was lacking, only producing one sack. Reserve linebacker Quentin Groves forced a fumble, but the Browns couldn't fall on it. Packers' quarterback Aaron Rodgers threw for three touchdowns, and running back Eddie Lacy ran for one. The Cleveland Browns as a whole simply looked more motivated with Brian Hoyer under center than with Weeden. The Browns visit the Kansas City Chiefs at 1 p.m. on Oct. 27, with former Washington Redskin Jason Campbell under center. He's a better option than most of the free agents on the market, such as David Carr, Byron Leftwich, John Skelton, and former Browns first-rounder Brady Quinn. The Buffalo Bills are doing a much better job of handling their poor quarterback situation, as they came away with their third win of the season Oct. 20. Kickers are a common theme, as Dan Carpenter's three field goals led the Bills to a 23-21victory over his former team, the Miami Dolphins. Quarterback Thad Lewis threw 21-of-32 for 202 yards, which was enough to get the job done. Fred Jackson scored a touchdown in his 11-carry, 36-yard day, but defense was key to the victory despite Dolphins quarterback Ryan Tannehill throwing for three touchdowns through the air. The Bills intercepted Tannehill twice, one of them being returned for the first score of the game by rookie defensive back Nickell Robey. Safety Aaron Williams was responsible for the other interception. Defensive end Mario Williams forced a fumble that was recovered by defensive tackle Kyle Williams. Tannehill only gained 190 yards through the air, and running backs Daniel Thomas and Lamar Miller were corralled to 60 yards and 43 yards, respectively. The 3-4 Bills defense hopes to continue their strong trend into next week when they play the New Orleans Saints in the Louisiana Superdome at 1 p.m. Oct. 27. If the Pitt Panthers had to pick a week to be missing McDowell grad James Conner in the backfield, it would have been this week. After Old Dominion jumped out to a 10-0 lead in the first, junior running back Isaac Bennett and the Pitt Panthers defeated the Division I-AA squad of 35-24 at Heinz Field Oct. 19. Conner's shoulder injury left the door wide open for Bennett, who went off on Old Dominion's defense. Bennett ran for 240 yards and scored three touchdowns in the second quarter to dig the Panthers out of the10-0 hole. Despite from the fact that he put up those numbers against Old Dominion, those numbers are screaming Bennett doesn't plan on being second to Conner during his time at Pitt. Conner, Bennett, and freshman Rachid Ibrahim have worked best as a backfield by committee. There is always a fresh back to go in, more than one capable back can come in at a time, and all three have different playing styles. Conner (6'2", 230) is a downhill power runner. Bennett (5'11" 205) offers a balanced style and experience. Ibrahim (6'1", 185) is a change of pace back with speed and good hands out of the backfield. Quarterback Tom Savage and his receivers also get in on the rushing attack because of the spread offense Pitt runs. The running game will be key Oct. 26, as Pitt is visiting the Navy Midshipmen, who run an old-fashioned, triple-option, clock-eating offense similar to what Conner ran during his time at McDowell. Conner is probable for Saturday. The Detroit Tigers were eliminated by the Boston Red Sox in six games for the American League Pennant. The only win the Tigers picked up was at home in Game 4 on Wednesday, Oct. 16. Doug Fister picked up the win in six innings of work. Right fielder Torii Hunter, third baseman Miguel Cabrera, and center fielder Austin Jackson all had two RBI, and seven different Tigers scored runs. Cabrera led the Tigers with 4 RBI over the duration of the ALCS, but pitching staff collapses in games two, five, and six led to insurmountable leads for Cabrera and the Tigers offense. Righty Anibal Sanchez earned three runs off of four hits in game five and put the Tigers down early. Game six looked like game two all over again, as it took the combined efforts of pitchers Max Scherzer, Drew Smyly, and Jose Veras to get out of a four-run seventh inning, and the Tigers simply couldn't come back. The Red Sox stomped out their fire. The Red Sox are taking on the St. Louis Cardinals in the World Series. The 2013 World Series is the first time since 1999 that both pennant winners began the postseason as the top seed in their respective leagues. The first pitch of game one in Boston is at 8:07 p.m. on Wednesday, Oct. 23. The Erie Otters won two home games this past weekend, the first being a 4-3 victory over the Belleville Bulls on Friday, Oct. 18. 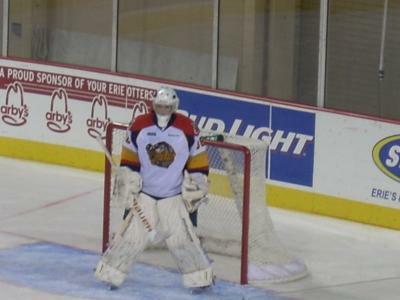 The Otters led 4-1 at the end of the second period, but Oscar Dansk and the defense were able to keep the win for Erie. McDavid, who is coming into a playmaker-type role, had an assist on all four goals. Fox and Brown both scored twice. The second home victory came Oct. 19 against the Ottawa 67's. Brown had four assists in the 6-2 victory. A second period that earned a standing ovation from 3,779 fans saw five goals scored. Defensemen Adam Pelech (NYI) and Darren Raddysh both scored, as did Austrian left winger Andre Burakovsky (WSH). Fox contributed two goals again on Saturday night. Fox's 13 goals on the season lead the OHL. Despite being listed as a center, Fox has been playing as the first line left winger with McDavid and Brown. At Fox's unheard of rate of production on the wing, he is on pace to score 73 goals and have 51 assists on the season. Fox, who turned 20 on Oct. 13, will not be an NHL Free Agent much longer if continues to put up these gaudy numbers. In the upcoming week, the 9-2-1 Otters host the Plymouth Whalers Oct. 23 at 7 p.m. They also host the Peterborough Petes at 7 p.m. Saturday, Oct. 26. They are also visiting the London Knights on Friday, Oct. 25. The Knights have been known for their offensive firepower in the OHL for years. Knights-Otters match ups this season look like they will be score fests. The Knights and Otters will face each other six times this season. The Pittsburgh Penguins went 3-1 on a four-game week that held the Edmonton Oilers, Philadelphia Flyers, Vancouver Canucks, and Colorado Avalanche in store. Left wingers Pascal Dupuis and Chris Kunitz both scored against Edmonton, as did center Evgeni Malkin. Marc-Andre Fleury saved 20 shots of the 22 he faced in the 3-2 victory. The Penguins were dealt their second loss of the season by Gabriel Landeskog and the Colorado Avalanche in a 1-0 loss. Landeskog put a wrister behind Fleury in the second period for the only goal of the game. The hard-fought game saw a lot of time on offense for the Pens, but they were shut out by Jean-Sebastien Giguere. The Pens got off 34 shots in comparison to Colorado's 14. This was Fleury's first loss of the season in net. In the upcoming week, the Pens play the New York Islanders at home Oct. 25 at 7 p.m. and then hit the road to play the Toronto Maple Leafs Oct. 26 and Carolina Hurricanes Oct. 28. The Buffalo Sabres finally picked up their first win of the season Oct. 15 in a 4-3 shootout victory over the New York Islanders. Left wingers Thomas Vanek and Marcus Foligno both scored goals, with the former being on a power play. Center Tyler Ennis also picked up a goal. Goalie Ryan Miller faced 44 shots between regulation and overtime, but he was solid in the shootout, stopping two of three. Vanek and Ennis both put the puck behind Islanders goalie Evgeni Nabokov to ensure the victory. The glory was short-lived, as hosting the Vancouver Canucks Oct. 17 resulted in a 3-0 loss. The Sabres couldn't put anything behind Canucks goalie Roberto Luongo and the defense let Ryan Miller face 34 shots. A .912 save percentage is sufficient, but not when facing more than 30 shots. The losses continued Oct. 19, as the Colorado Avalanche dealt the Sabres a 4-2 defeat. Foligno and center Cody Hodgson scored for the Sabres, and the defense was able to keep Miller from getting peppered for a change. Miller saw 26 shots, which is a break for him. Miller is facing 36.71 shots per game. Going forward, the Sabres schedule is not getting lighter. A visit to the Florida Panthers will be the defense's only break, as Buffalo also plays the Tampa Bay Lightning, the Boston Bruins, and the Dallas Stars in the upcoming week. Adam Unger can be contacted at aUnger@ErieReader.com, and you can follow him on Twitter @AdamUnger28.